I have lived here for years but the massiveness of the Amazon river never stops to amaze me. 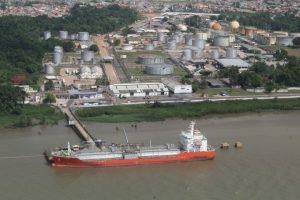 We cross a small section of this river on a weekly basis as our island is located in the middle of two deep water channels that ocean going cargo vessels travel day and night. At night we can see the lights pass in front of our house, while during the day ships will blast their horns warning the small fishing boats to clear out of their way. These are big ships that tower over the small boat as we pass by them on our way to the city. Some might ask, do our boats have problems out on this river and the answer is yes. These little boat do break down and we get stranded till another boat can come and recurse the passengers. The longest you have to wait is a half hour but it can still be nerve racking floating down river on a boat without a working engine. So remember to pray for us and our safety as we travel.